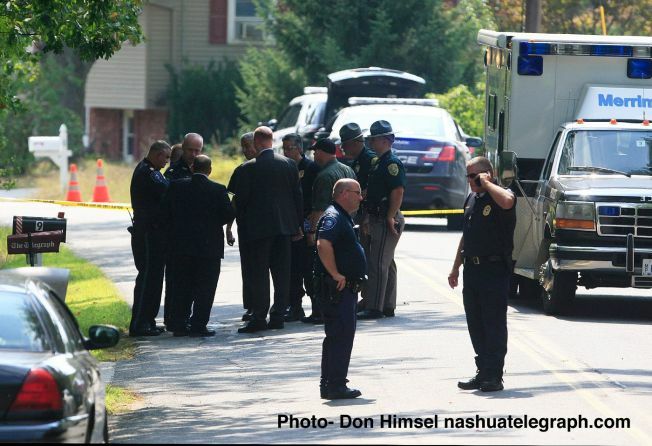 A man shot by police Thursday in Merrimack, New Hampshire, died from his injuries Friday evening, officials said. Police responded to 8 Joppa Rd. after a man had allegedly threatened his father with a knife. When they got there, an officer fired at Lambert, who police say was armed with a knife. The 23-year-old was airlifted to Beth Israel Deaconess Medical Center in Boston. The Massachusetts Medical Examiner's Office performed an autopsy Saturday on Harrison Lambert and determined that he had died from multiple gunshot wounds. According to New Hampshire Attorney General Joseph Foster, the medical examiner's office determined Lambert was shot five times. The manner of death was determined to be homicide, which, as Foster noted, merely means he was killed by another person. "I had heard that police were called on him quite a few times by his own parents, just him acting angry," said neighbor Kayla Kimball, who said her father had to break up a fight Lambert had with another neighbor a few months ago. The death remains under investigation. Anyone with information is asked to call New Hampshire State Police (603) 223-8849.